Earlier in the year, the NRC released a report on how to reduce fuel consumption of large trucks (see here and here). Last week the EPA issues a first ever fuel efficiency standard for trucks--see stories at greenautoblog and at USA Today. "The complex proposal would cut fuel use 10% to 20%. "We've been flatlined at 6 to 6.5 miles per gallon for years" for a loaded tractor-trailer rig, says Glen Kedzie, vice president at the American Trucking Associations, a major industry trade group. 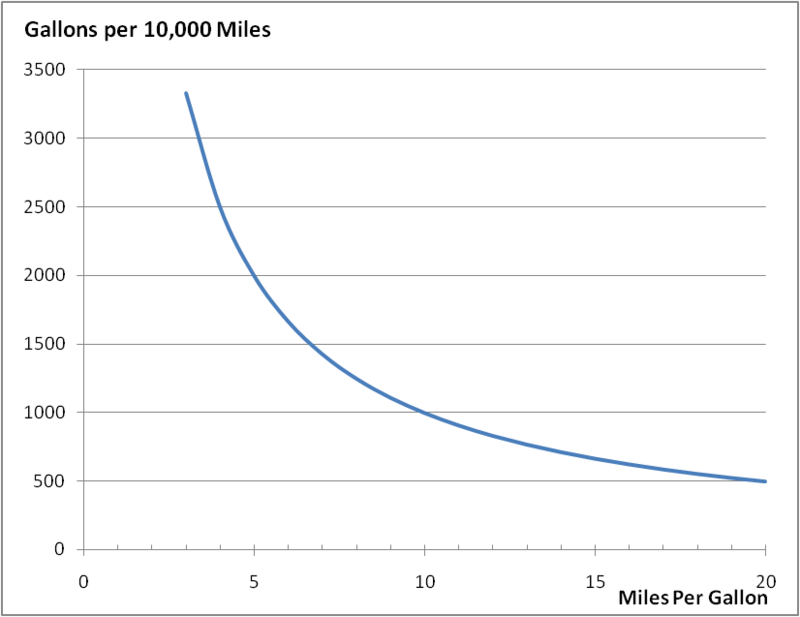 That translates to about 16 gallons of diesel fuel per 100 miles. 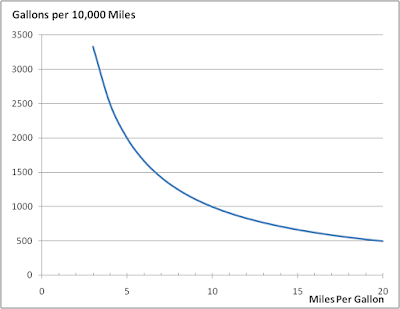 A 20% gain would cut fuel use to about 14 gallons per 100 miles. Major trucking and shipping interests endorsed the move for its potential cost savings. ATA noted that it has backed fuel-consumption regulations since 2008. "The proposal, using current technology, is achievable," spokesman Brandon Borgna says. Though the emphasis is on semi-tractor rigs and other big trucks, the regulations would apply to vehicles as small as those with an 8,500-pound gross vehicle weight rating (the safe weight of the truck and cargo combined) — a Ford F-250 pickup or equivalent. The government forecast the truck rules would cost the industry $7.7 billion, but save $35 billion in fuel." 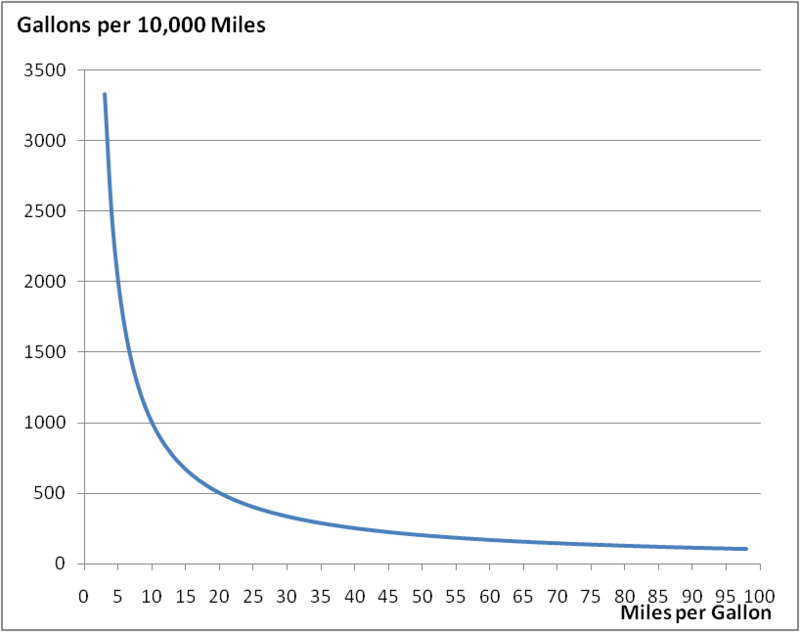 The top graph shows how steep the region is in the low MPGs (and how flat at high MPGs). The graph below focuses on the slope at the low end. 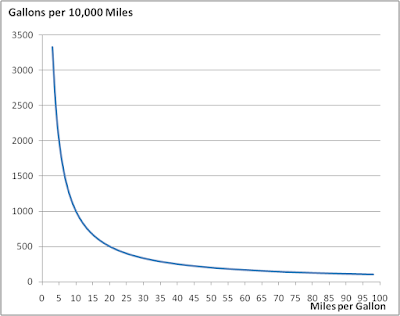 A vehicle that gets 5 MPG is using 2,000 gallons to drive 10,000 miles. Improve it to 8 MPG, and you save 750 gallons. The House also approved by voice vote H.R. 445, Heavy Duty Hybrid Vehicle Research, Development, and Demonstration Act of 2009, authored by Rep. F. James Sensenbrenner, Jr., a Wisconsin Republican. The legislation directs the Secretary of Energy to establish a competitive research, development, demonstration, and commercial application program to provide between three and seven grants of up to $3 million per year each to carry out projects to advance research and development and to demonstrate technologies, including plug-in hybrid technology, for advanced heavy duty hybrid vehicles. "I applaud the House for taking this important step in promoting new technology that will help achieve energy independence and combat climate change," Sensenbrenner said. "This legislation takes an innovative approach to reducing greenhouse gas emissions, lessening our dependence on foreign oil and strengthening the U.S. economy." Sensenbrenner said he hopes that Senator Herb Kohl, a Wisconsin Democrat who is an original bill co-sponsor, will move the legislation through the Senate with similar success. "The heavy truck sector accounts for approximately one-fourth of the nation's fuel use and the majority of transportation-based emissions," said Gordon. "Even small improvements in their efficiency can have a substantial impact." 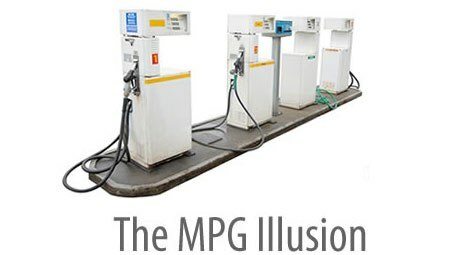 "Hybrid technologies hold the promise of greatly reducing the fuel consumed by the nation's truck fleet," said Gordon. "This bill represents another common sense approach to chipping away at our energy challenge."